Well, as much as I have been trying to continue to deepen my understanding of the meaning of Christ’s death this week, I have realized in the last few days that a different season has arrived than that of my single days of discerning my vocation and praying for my future spouse and family. The luxury of drifting into quiet prayer at any given moment, of stillness, of constantly receiving consolations have been replaced with constant noise, both joyful and dreadfully unpleasant, and of giving what I have received in continual instruction to my children. Last night we attended the Good Friday liturgy, and as we stood up to begin to walk in a procession to venerate the cross (which is SO beautiful), a bouncy, smiley toddler was next to me looking up into my eyes with curious anticipation. I got down at her level to explain to her that we were about to all walk up to a big cross and she could touch the cross, kiss it and say “thank you” to Jesus for dying for us or whatever came to her heart. As I approached the cross myself, I could feel my heart starting to race, a nervousness come over me, an inability to control my emotions. Although there were people all around me approaching it from all directions, I felt like I was the only person alive. The only one that Jesus died for and a burden came over me. Placing my lips upon the wood, probably touched and kissed hundreds of thousands of times, I walked away with tears welling up and a knot in my throat enlarging by the millisecond. And then as I got back to my seat, I felt a soft chubby hand grab mine as she bounced up and down in excitement. I turned to my right to see my beautiful baby sis, kneeling, head sunken in her hands, deep in prayer, obviously touched, engrossed in her personal meditation time and I smiled remembering those days with sweet fondness, thanking God for that season which strengthened me for this current chapter of my life where quiet, lengthy prayer times are scarce and rare. While I still do need quiet, personal prayer time, now I am constantly incorporating my religious experiences into the life of a child. I am called not to keep my meditations for myself but to apply what the Lord shows me by teaching my children each and every day. It’s a tremendous responsibility but it’s so fulfilling! Who doesn’t want to share their faith with others? 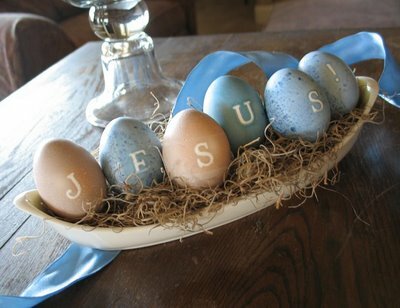 I am able to remind my Spicy that the Easter egg symbolizes new life and why the birth of the baby chic emerging from the shell is similar to the resurrection. I get to share why we refrain from saying or singing “Allelujah” during Lent and teach her a simple chorus of Allelujah’s I learned that we can yell at the top of our lungs tomorrow. And guess what? She gets it and she is the easiest person I have ever tried to witness to or evangelize because she listens with an open, pure heart hungry & thirsty for Christ’s true redeeming love! And so, this year was special because in the sadness and loneliness of Holy Saturday, I was constantly reminded through my children of God’s provision and promise. It is always right smack in front of my face, impossible to ignore, cries and giggles and all. Hence, we spent all morning & into the afternoon preparing goodies for our friends, family and neighbors. Not too shabby for a 3 year old, eh? Barf! Er, I mean, beautiful!!!! I must admit I broke my Lenten sacrifice terribly as I licked gobs of icing and cookie dough from my fingers hands but technically Easter celebrations begin in just a few hours. And this simple, attempted project was a flop due to a couple stickers not adhering but we’ll just pretend these are mine until next year. Hope your preparations have been beautiful on this Eve of arguably the most important day for us followers of the Living Christ! Really beautiful and so wise! I have a lot to learn from my little sis 🙂 Love you!